(KTLA) Los Angeles firefighters were on the scene of a possible underground vault explosion that left debris strewn across a street in South Los Angeles on Wednesday. The incident occurred around 3:27 p.m. in the 6200 block of South Brynhurst Avenue in the Hyde Park neighborhood, according to the Los Angeles Fire Department. 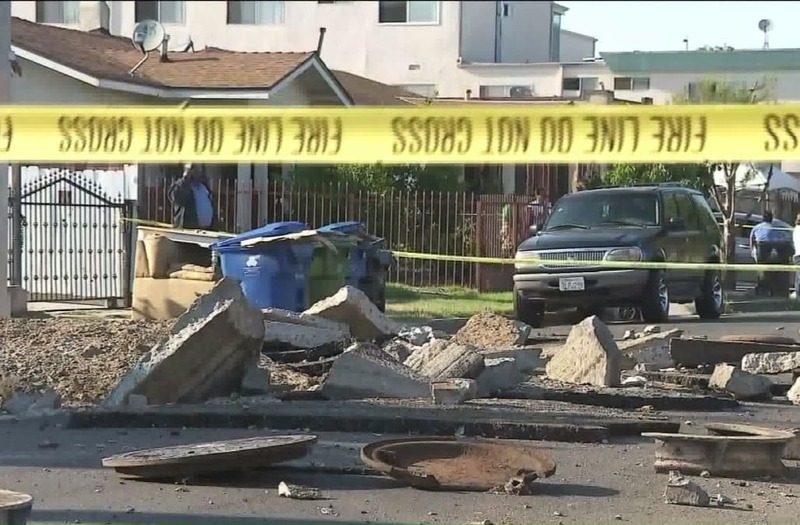 Los Angeles fire authorities were on the scene of a possible underground vault explosion in South Los Angeles Wednesday that started neighbors and left a giant hole in the street. Video shot by residents in the neighborhood shows a large hole in the middle of the street. At least two man-hole covers appeared to have been blown off. "We heard a loud boom. They didn't know if it was a gas explosion; we've never heard anything like that," said Sheri Timmons, a resident. "We could just smell some sort of gas." Another resident said she felt the explosion as a "mini earthquake." Officials from the Los Angeles Department of Water and Power and SoCal Gas were notified and arrived on the scene to assess the situation, the Fire Department said. "We believe it's electrical in nature," said fire Battalion Chief Chris Larson. "We have DWP coming out to determine the nature and the extent of damage and the cause of the initial explosion." No injuries have been reported, authorities added, but a parked SUV had its back window shattered. A representative with DWP told KTLA late Wednesday that the utility had not determined if its equipment was involved. "We had no outages on the high voltage lines running through that vault," spokesman Joseph Ramallo said in an email. "No apparent cause or indication that our equipment caused the blast at this point." LAFD initially described the neighborhood affected as West Adams; it is Hyde Park.